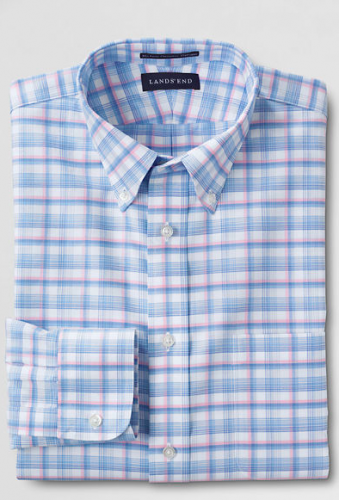 Lands' End Tailored Fit non-iron Supima Oxford shirt in Keel Blue multi plaid. When Lands’ End sent us the shirt pictured above, our main goal was to wear it in a way so we didn’t look like Mitt Romney. Not that there is anything wrong with ol’ Willard, but we don’t live in New England, vacation in Martha’s Vineyard, nor know our way around a sailboat. 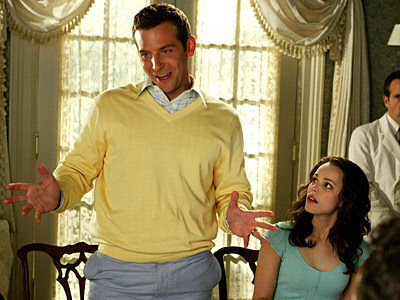 Like most Chicago men, head-to-toe preppy is not our look. You can wear a plaid pastel shirt and still mean business. To keep this outfit from feeling too breezy, we made sure that only the shirt had light features. 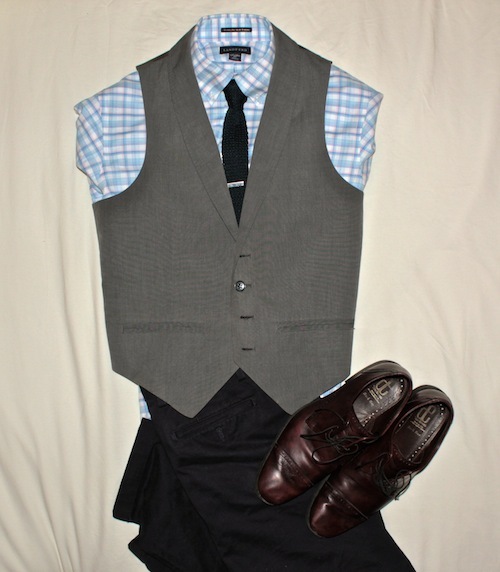 The knit tie and pants are both navy blue (the pants available at Lands’ End Canvas) and they are complemented by the dark gray vest. Pairing a blue and pink pastel shirt with jeans is fine, but go for jeans with a darker rinse so you don’t look washed out. In this outfit, the shirt is paired with raw denim jeans from APC. Up top, the tie is optional. 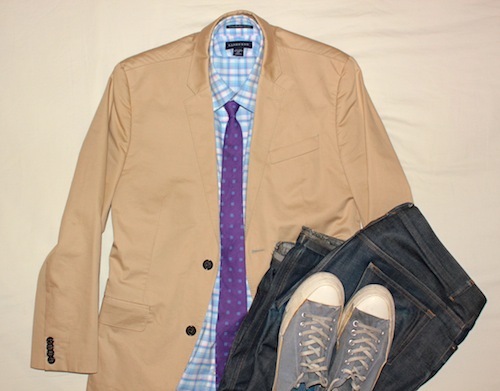 Putting khaki with pastel almost always works, which is why we chose a khaki jacket to wear over the shirt. 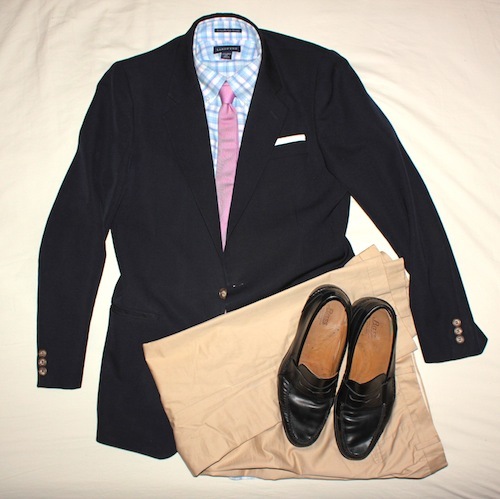 On the surface, this outfit looks rather preppy, since it features a blue blazer, khaki pants and loafers. But to make it more Italian than American, stick with slim-cut khaki pants (the ones pictured are from H&M) and wear the loafers without socks. A slim blue blazer will complete the look. And a quick note about the tie: when wearing a tie with a plaid shirt, we suggest keeping things simple. Either wear a solid-color tie like above, or one with a very subtle pattern. The shirt pictured in all the outfits is available at Lands’ End’s website for $50. It is made from Supima cotton, which is an extremely soft and non-iron material. The collar size and sleeve length are customizable, and the shirt is classified by Lands’ End as “Tailored Fit.” This is a little slimmer than the company’s standard fit, but still, it’s definitely not just for very slim men. Finally, to see more of Lands’ End clothing, check out the brand’s trunk show from 5 to 7 PM tonight at the 316 Club Barber Spa, located in the loop at 175 W. Jackson St. The trunk show will feature J Henley, men’s design director for the brand. There will also be a scotch tasting, naturally.